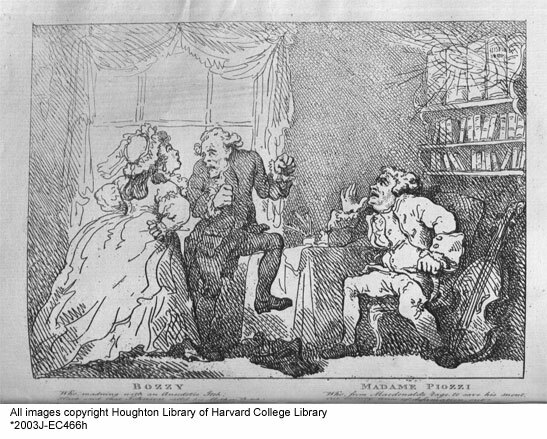 The world’s greatest Samuel Johnson collection, one book at a time. Although they don’t get a lot of respect in special collections circles, I’ve always had a certain fondness for fore-edge paintings. You make a fore-edge painting by fanning the right-hand edge of a book downward and painting an image on the edge of the leaves. When you release the leaves to their normal position, the image disappears. Fore-edge paintings were fashionable in the 19th century, but because of their popularity with collectors, it’s not uncommon for 19th century books to have much later paintings applied, for the sake of the resultant price boost. I’m not enough of an expert to judge the authenticity of this painting, but it’s hard not to wonder how a scene of duck hunters ended up on a poem intended “to teach young women the virtues of a pleasant nature” (DNB). 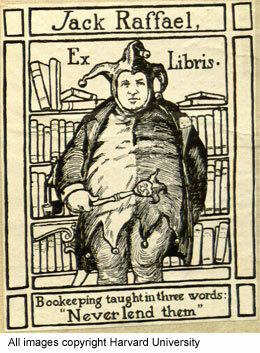 This edition of the works of Richard Savage has the bookplate of Jack Raffael, showing a portly jester in front of a shelf of books, and bearing the motto “Bookeeping [sic] taught in three words: Never lend them.” Sounds like he learned that the hard way. I haven’t been able to I.D. Raffael positively, but Google turns up some hits in the Internet Broadway Database as an actor in the 1910s and 1920s, and the Harry Ransom Center has a book of his on 18th century London theater, so I wouldn’t be surprised if it’s the same guy.